On Sunday tens of thousands are set to converge on the White House in what organizers are promoting as “the largest climate rally in U.S. history.” The protesters will be calling on Barack Obama to reject the Keystone XL pipeline. Alongside one of this country’s biggest corporations, Stephen Harper’s government has entangled Canada in one of the most controversial decisions of Obama’s presidency. The Conservatives have lobbied vigorously in support of Calgary-based TransCanada’s plan to build a $7 billion pipeline to take up to 800,000 barrels of oil a day from Alberta to refineries on the Gulf Coast. The prime minister has pressed Obama to approve Keystone XL while his ministers have visited Washington to pursue the matter with the Secretary of State. During two visits to Washington in recent weeks foreign minister John Baird said Keystone XL was his main priority. The ambassador responded to critical media commentary and pressed state officials to support the pipeline. When Nebraska’s Republican governor Dave Heineman initially came out against the project Doer visited him in Omaha. Similarly, the 28 members of Congress who urged the State Department to consider the “major environmental and health hazards” posed by Keystone XL received an immediate letter from Canada’s ambassador and Alberta’s minister of intergovernmental relations. “I believe it necessary to address several points in your letter,” Doer wrote. The ambassador’s letter trumpeted Canada’s plan to reduce overall greenhouse gas emissions 17 percent below 2005 levels by 2020. “[This is] a benchmark we intend to meet,” Doer wrote, even though planned tar sands expansion will make this objective impossible to reach. Canada’s 22 consular offices in the US have also been ordered to take up the cause. When the New York Times ran an editorial titled “Say No to the Keystone XL” Canada’s consul general in New York wrote a letter supporting the project. 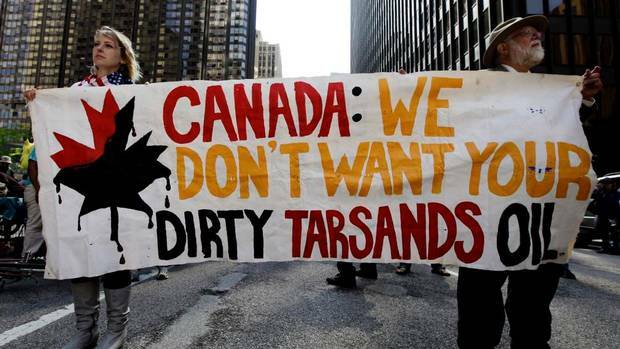 Many Canadians share American environmentalists’ concerns about the tar sands’ ecological footprint. But, even those who do not should worry about the impact the Harper government’s lobbying will have on this country’s reputation. Once upon a time Canada was seen as a beacon to progressive Americans. What will we be known for in years to come? Yves Engler is the author of Lester Pearson’s Peacekeeping: The Truth May Hurt. His latest book is The Ugly Canadian: Stephen Harper’s foreign policy. Read other articles by Yves, or visit Yves’s website. This entry was posted in Energy, Pipelines and tagged Pipelines. Bookmark the permalink.